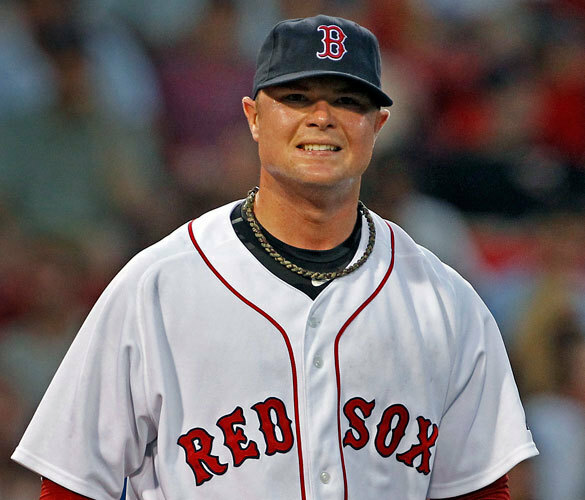 (Jim Davis/Globe Staff) Red Sox starting pitcher Jon Lester reacted after his third-inning throwing error gave Cleveland a 1-0 lead. In the real world, a first-time father returns to work after a day or two off and eases back into the routine while showing everybody photos of his pride and joy. Jon Lester’s task last night was to climb the mound at Fenway Park in drenching humidity and to try and pump pitches past the Cleveland Indians. Sleep had come sparingly since the arrival of his son Hudson on Saturday and after a few innings his left hamstring started to ache. Errors, a passed ball, and the other residue of a season going steadily awry only made things worse. “He’d had a long three or four days,’’ Red Sox manager Terry Francona said. By the time Francona came to the mound to take his ace out of the game in the sixth inning, Lester was headed for his fourth consecutive loss and the Sox to a 9-1 thrashing at the hands of one of the worst teams in the league. The lone piece of good news was that Lester had only a cramp and won’t be the next Red Sox player stuffed inside an MRI tube. The lefthander wanted to stay in the game but Francona wasn’t going to take that chance and lifted him in the sixth inning with the Sox trailing, 4-0. “I didn’t see a reason to push and let him grind through another inning,’’ the manager said. The Sox, now 6 1/2 games out in the wild-card race, will finish their homestand tonight and travel to New York for a four-game series against the Yankees. Lester is scheduled to start Monday and expects to be closer to his All-Star form. Lester has not won since July 9, going 0-4 with a 4.39 earned run average since, although the Sox have only scored three runs in his last four starts. Pitching coach John Farrell hasn’t detected any mechanical flaws, only a series of misplaced pitches and misfortune. “There’s nothing physically that is the cause of any of this,’’ Farrell said. Lester came out seemingly determined to put an end to his losing streak as he retired the first six hitters in order on 21 pitches. But the bottom three hitters in Cleveland’s young lineup created problems in the third inning. Andy Marte, a .195 hitter, drew a five-pitch walk. Trevor Crowe, who entered hitting .181 against lefthanders, then singled down the third base line. Lou Marson followed with a bunt that was pushed too hard to Lester’s right. The pitcher had ample time to get Marte at third base but threw the ball away. Marte scored and Crowe took third as Lester stood and watched instead of covering the bag as Adrian Beltre chased the ball down. The Indians struck for two more runs in the fifth. Asdrubal Cabrera had a sacrifice fly and Shelley Duncan an RBI double to the opposite field. Lester then bent at the waist behind the mound, trying to get loose. That prompted a visit to the mound by Francona, a trainer in tow. Lester convinced them he was fine. Francona came to the mound again in the sixth inning, concerned with what he was watching. But once again, Lester made his case to stay in the game. Jayson Nix lined the next pitch off the foul pole in left. When Marte followed with a hit, Francona came back out and Lester was done. “I felt like I gave [the home run] up,’’ Francona said. The game turned ugly for the Sox and reliever Scott Atchison in the seventh. Errors by first baseman Victor Martinez and shortstop Marco Scutaro led to a run before Marte belted a three-run homer. In all, the Sox allowed seven unearned runs. They also were hitless in nine at-bats with runners in scoring position, most of those early in the game when some run support may have changed the tone of the night for Lester. In his much-anticipated and delayed return to the lineup, Jacoby Ellsbury was 0 for 5. The Sox’ only run came in the sixth, when David Ortiz drove a Justin Masterson fastball over the wall in straightway center. It was the 23d home run of the season for Ortiz and extended his hit streak to 13 games. Masterson has beaten the Red Sox twice this season, allowing one run in 14 innings. He is 2-10 with a 5.98 ERA otherwise. He lasted only five innings last night, but that was plenty given how Lester was struggling. start for Red Sox’ Pedroia?